This legislation is being pushed forward under the guise of alternative energies to make the United States energy independent and is expected to have the support of President Bush who has stressed the need for "alternative energies" rather than "renewable energies", thus making room for coal. The legislation being proposed includes: loan guarantees of upwards of $30 billion for 6-10 coal-to-liquid plants; $0.51 per gallon tax credit for all coal derived fuel sold through 2020; and federal subsidies if the price of oil drops below $40 per barrel. While converting coal to diesel type fuels would help the United States become energy independent it would also be extremely counterproductive to our efforts to decrease carbon dioxide emissions to slow global warming. 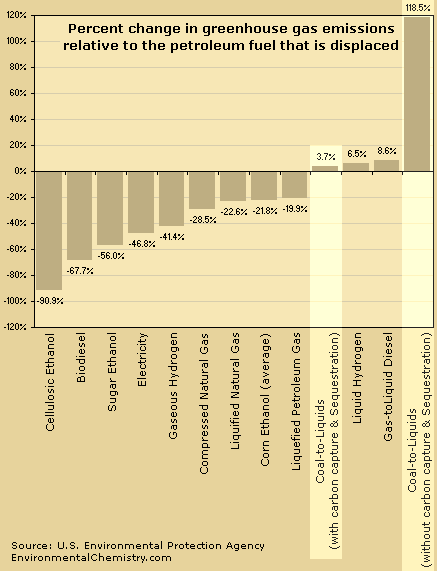 According to the U.S. Environmental Protection Agency (see graph below), even if carbon capture and sequestration was implemented in the coal to diesel conversion process the net amount of total lifecycle greenhouse gases that would be released per BTU of fuel produced and consumed would be 3.7% higher than using traditional production techniques to produce diesel fuel from crude oil. Without the use of carbon capture and sequestration, the amount of greenhouse gases released from the coal to diesel fuel conversion process would increase by 118.5%. The coal to liquid fuel proposals working their way through Congress have all the hallmarks of pork barrel politics that will make coal executives rich at the expense of the U.S. taxpayer with dire consequences for efforts to reign in CO2 emissions and global warming. Taxpayers should be very wary of tens of billions of tax dollars being sunk into what is essentially an industry driven experiment. History has shown that when corporate interests lobby for and get such huge amounts of taxpayer money the result is invariably a boondoggle and at the very least a waste massive amounts of money. The failure of the synthetic fuel initiatives of thirty years ago and the billions in taxpayer dollars that were wasted on the government owned Synthetic Fuels Corporation is just such an example. If the coal industry wants to move forward with finding new markets for coal via turning it into liquid fuels, it is their purgative. U.S. taxpayers, however, should not be the ones funding the research into this technology and said technology MUST NOT result in a net increase in greenhouse gas emissions for the total lifecycle of the fuel produced. The article points out the failure of the Synthetic Fuels Corporation in 1980 and how big of a gamble coal to liquids technology will be. According to Montley Fool it could cost far more than the $200 billion (yes with a "B") the coal industry estimates it would cost to simply displace only 10% of the U.S. demands for crude oil. As the Montley Fool states, "the public benefits of such an initiative are far from clear today." 1) The data for our graph comes from: http://www.epa.gov/otaq/renewablefuels/420f07035.htm I had provided a link to this EPA webpage mid way through the blog entry above, but apparently some people had not noticed it. I have added a second link to the EPA webpage in question beneath the graph to be more explicit about where the data comes from. The reason some energy sources like corn ethanol have such a modest reduction in GHG emissions in comparison to petroleum fuels is that while burning the corn ethanol itself doesn't release fossil carbon into the atmosphere, a tremendous amount of fossil fuels are used to grow and harvest the corn (e.g. to power tractors) and a great deal of energy is required to convert the corn into ethanol. We will be covering a lot of these issues in regards to specific alternative energy sources on our main website in the coming months through a series of articles we will be publishing on the topic of sustainability. The first of these articles is in the final stages of editing and we hope to publish it by the middle of June. Who is funding the climate change skeptics?